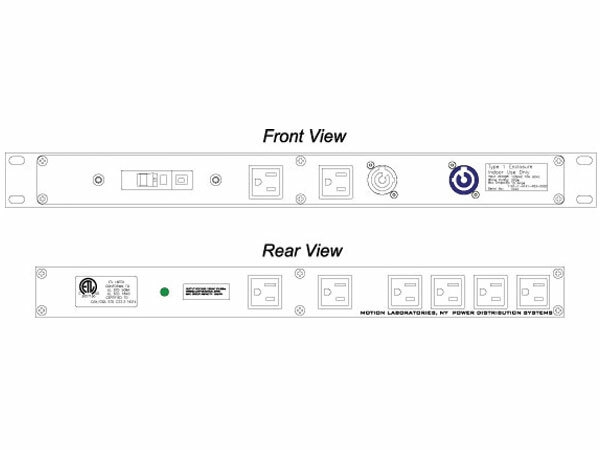 Motion LabsRac Pacs™ create a power distribution solution for electronic equipment racks. 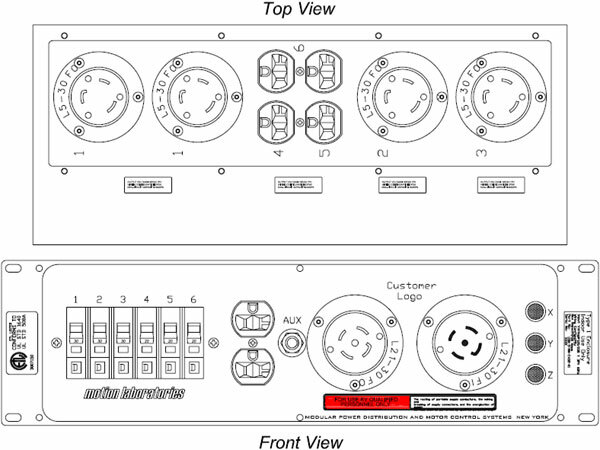 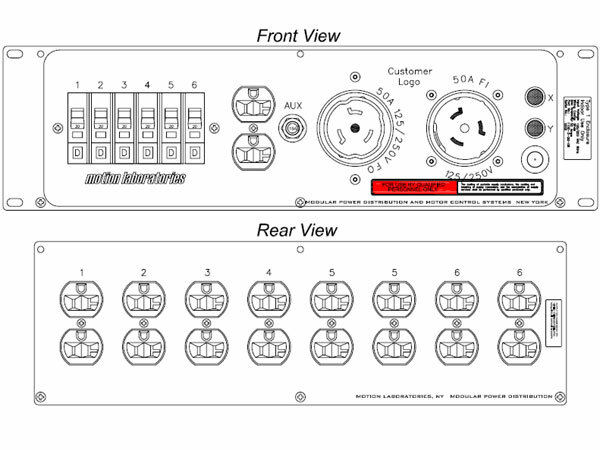 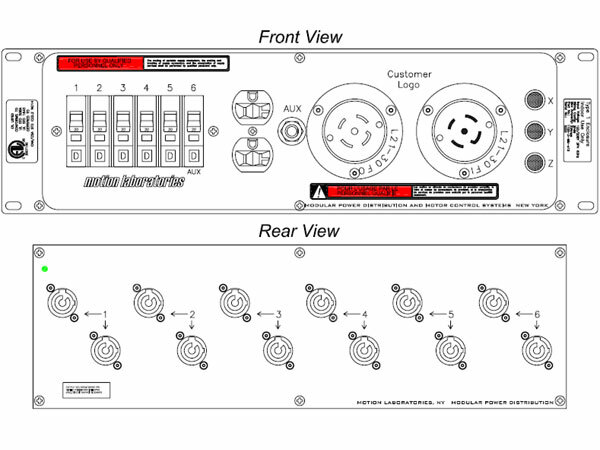 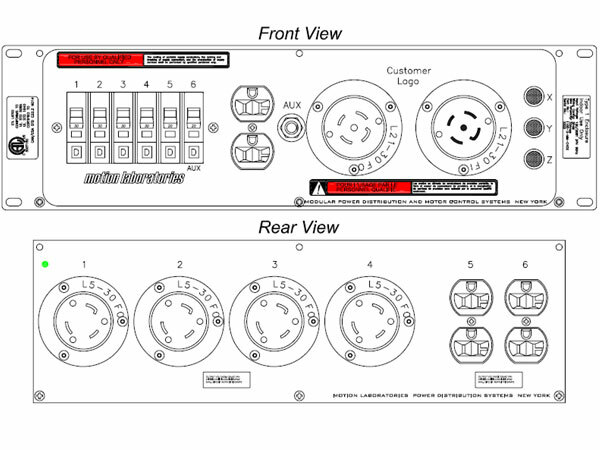 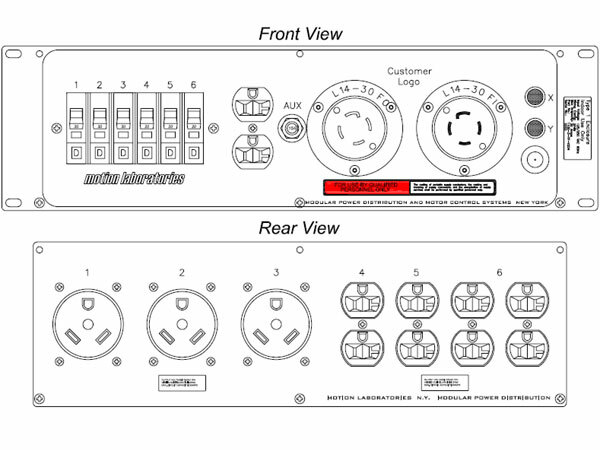 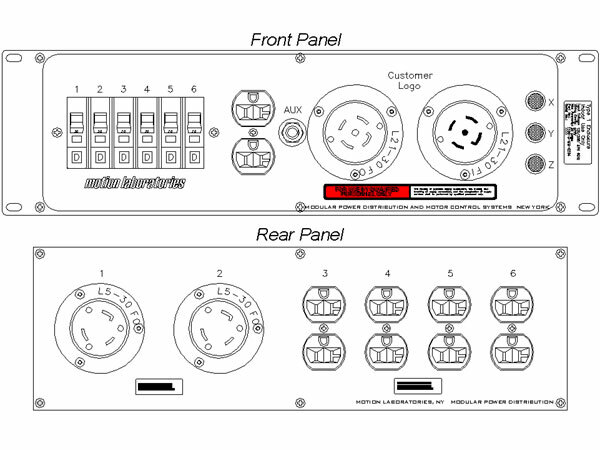 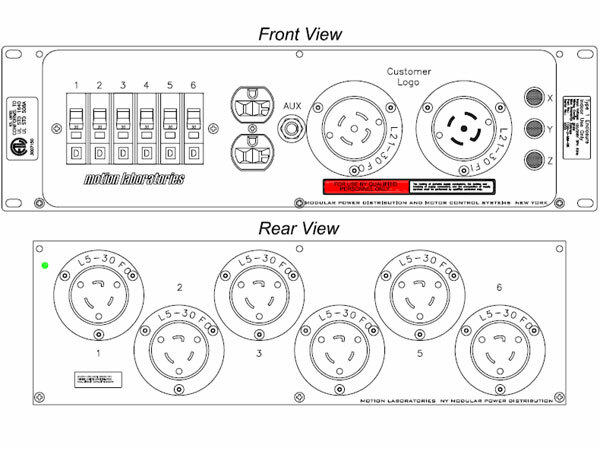 They provide adequate distribution of power for amplifiers, processing gear or any other rack mount equipment. 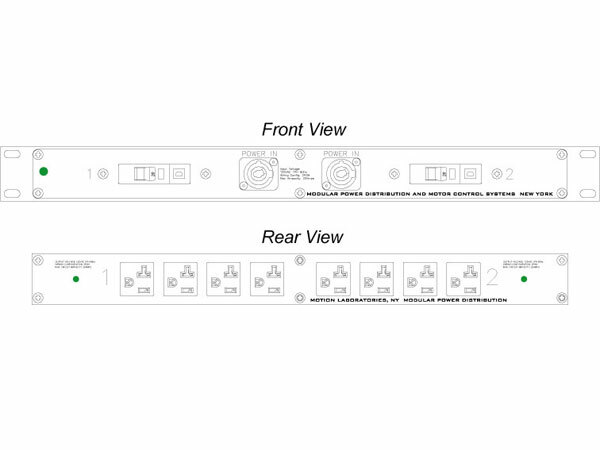 Our line of Rac Pacs™ are available with most industry standard connectors as Input/Pass Through and Output options to satisfy a wide range of applications. 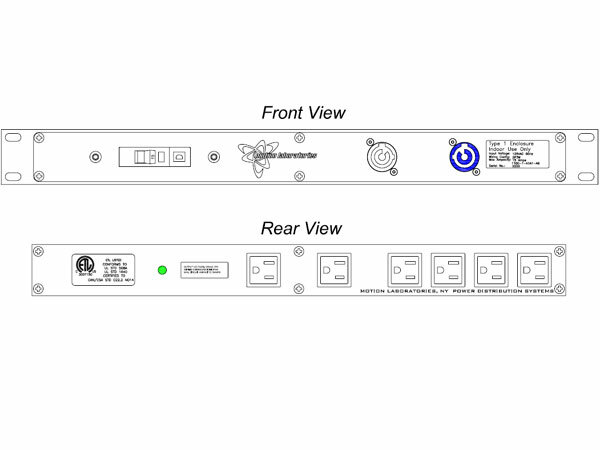 They are available in 1RU, 2RU or 3RU, depending on a delicate balance of space vs power requirements. 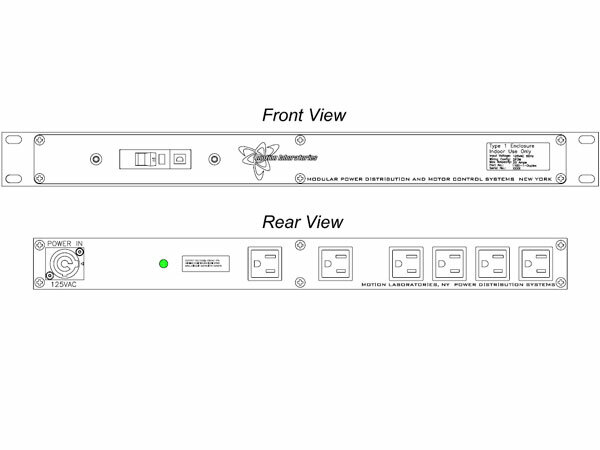 1RU: Due to its smaller format, this Rac Pac™ series has a limited configuration selection. 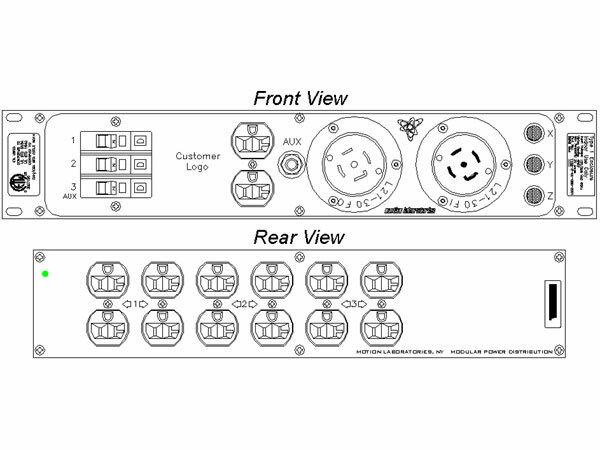 Primarily utilized for rack mount powerCON to Edison breakouts, or vice versa, this series sees a lot of action in processing racks or other A/V applications. 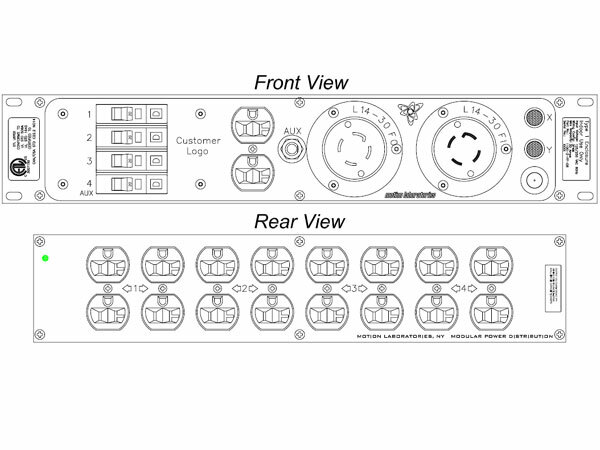 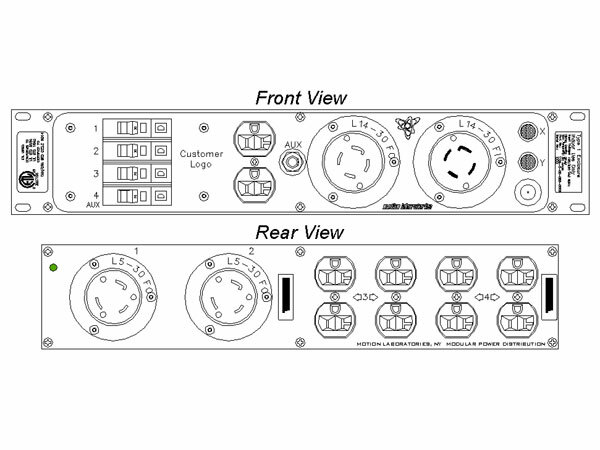 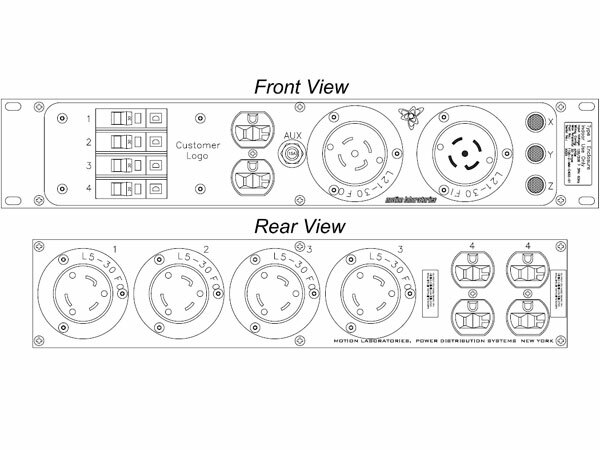 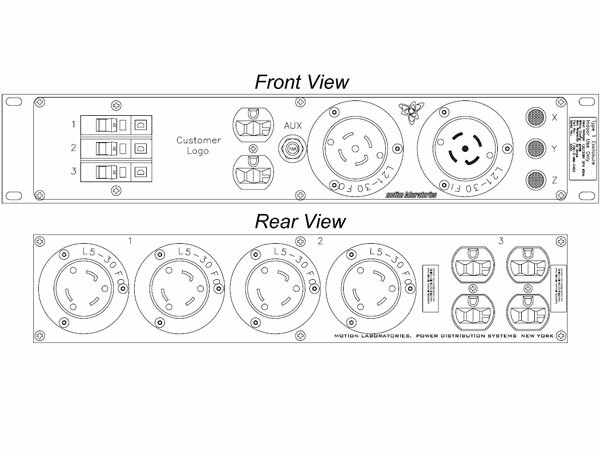 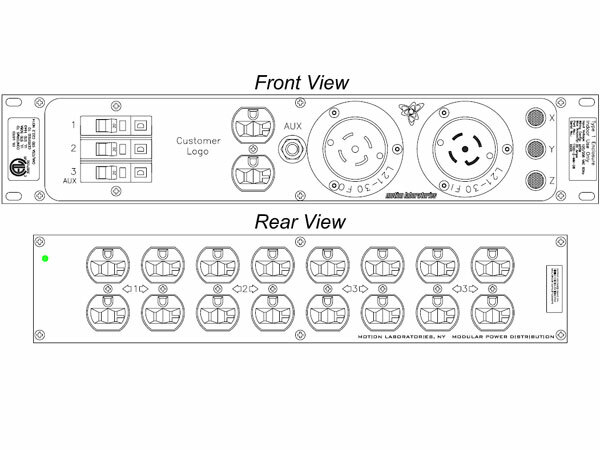 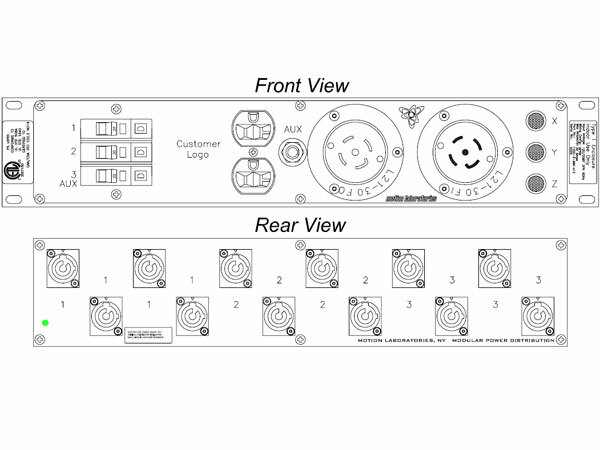 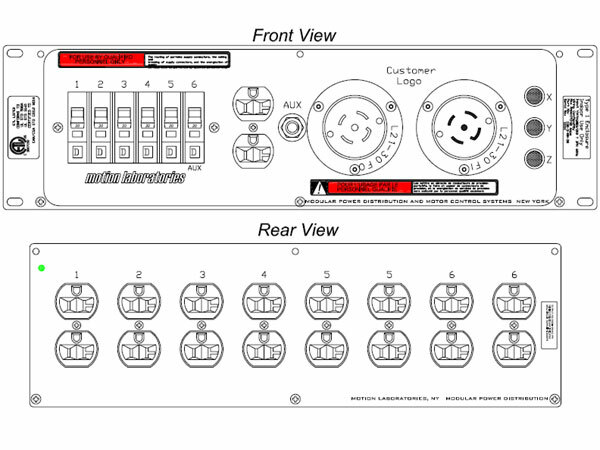 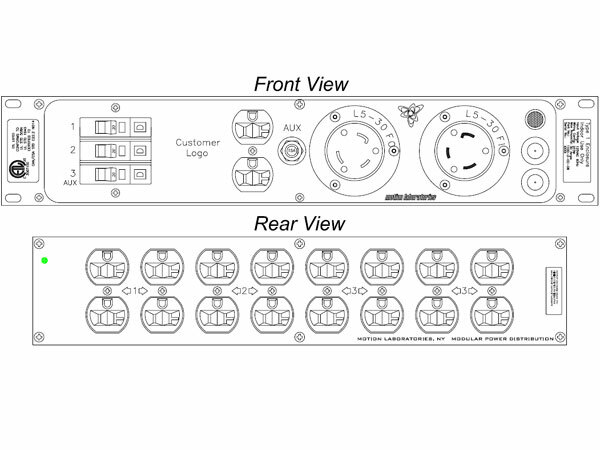 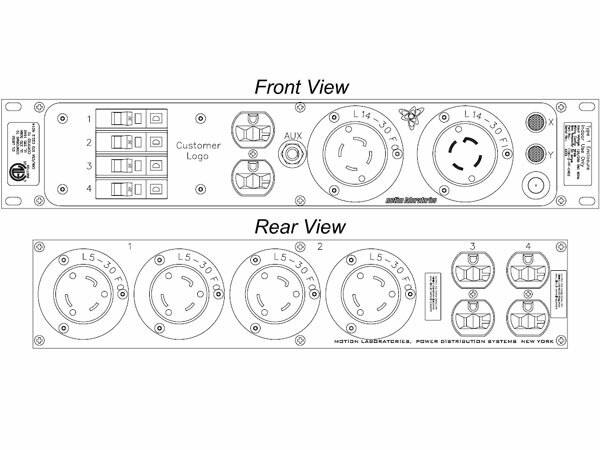 2RU: Able to support 3 or 4 breakered circuits with output capacity of up to 80 Amps (40A per leg) when powered by a CS-50A Connector, the 2RU Rac Pac™ is available for smaller amplifier racks or standard equipment racks. 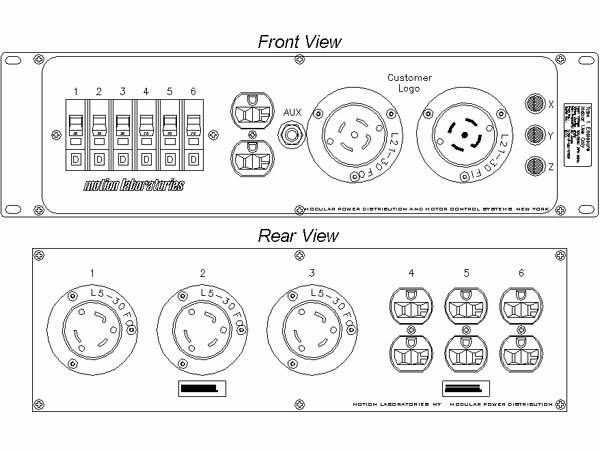 This series is available as a 3”, 5.5” or 7” depths. 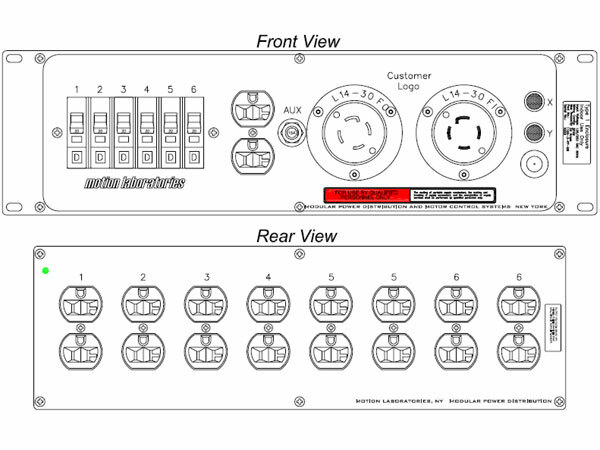 Deeper units are available with top or bottom output configurations. 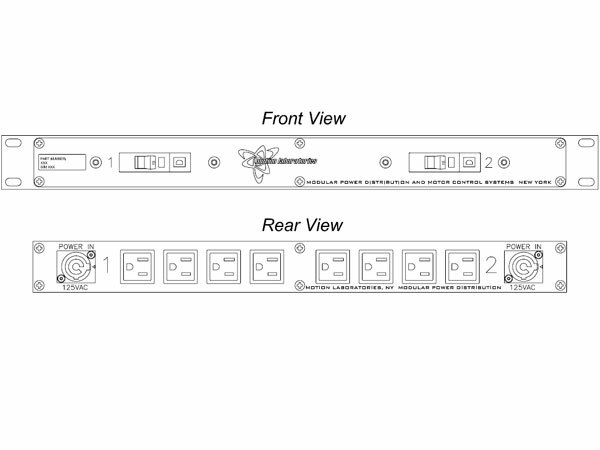 3RU: Able to support 6 breakered circuits with an output capacity of up to 100 amps (50A per leg) when powered by a CS-50A connector, the 3RU Rac Pac™ offers the most flexibility, with configurations substantially more varied due to the size and breaker quantities. 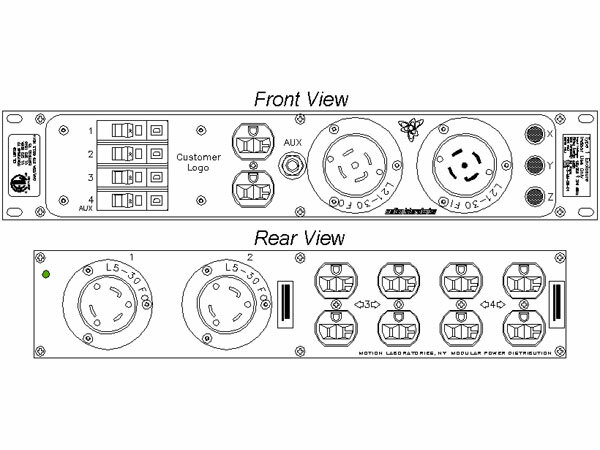 Available in 3”, 5.5”, 7” or 15” depths. 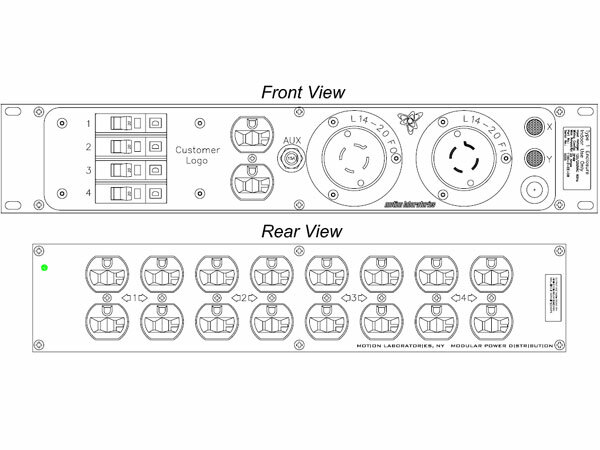 Deeper units are available with top or bottom output configurations. 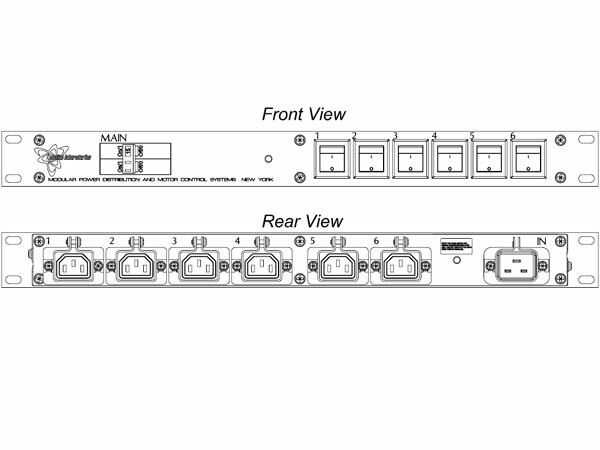 50A 125/250V In/Thru, 8 x 20A Duplex (Breakered @ 20 Amps), Fully Enclosed 3RU, 19" Rack Mount, Chassis Depth 7"
ETL Listed, L21-30 In/Thru, 4 x L5-30 (Breakered @ 30 Amps), 2 x 20A Duplex (Breakered @ 20 Amps) (Top Output), Fully Enclosed 3RU, 19" Rack Mount, Chassis Depth 5.5"
ETL Listed, L21-30 In/Thru, 12 x 20A Powercon (Breakered @ 20 Amps), Fully Enclosed 3RU, 19" Rack Mount, Chassis Depth 5.5"
ETL Listed, L21-30 In/Thru, 6 x L5-30 (Breakered @ 30 Amps), Fully Enclosed 3RU, 19" Rack Mount, Chassis Depth 5.5"
ETL Listed, L21-30 In/Thru, 4 x L5-30 (Breakered @ 30 Amps), 2 x 20A Duplex (Breakered @ 20 Amps), Fully Enclosed 3RU, 19" Rack Mount, Chassis Depth 5.5"
ETL Listed, L21-30 In/Thru, 3 x L5-30 (Breakered @ 30 Amps), 3 x 20A Duplex (Breakered @ 20 Amps), Fully Enclosed 3RU, 19" Rack Mount, Chassis Depth 5.5"
ETL Listed, L21-30 In/Thru, 2 x L5-30 (Breakered @ 30 Amps), 4 x 20A Duplex (Breakered @ 20 Amps), Fully Enclosed 3RU, 19" Rack Mount, Chassis Depth 5.5"
ETL Listed, L21-30 In/Thru, 8 x 20A Duplex (Breakered @ 20 Amps), Fully Enclosed 3RU, 19" Rack Mount, Chassis Depth 5.5"
L14-30 In/Thru, 3 x 30A Range Plug (Breakered @ 30 Amps), 4 x 20A Duplex (Breakered @ 20 Amps), Fully Enclosed 3RU, 19" Rack Mount, Chassis Depth 5.5"
ETL Listed, L14-30 In/Thru, 8 x 20A Duplex (Breakered @ 20 Amps), Fully Enclosed 3RU, 19" Rack Mount, Chassis Depth 5.5"
ETL Listed, L14-30 In/Thru, 8 x 20A Duplex (Breakered @ 20 Amps), Fully Enclosed 2RU, 19" Rack Mount, Chassis Depth 5.5"
ETL Listed, L21-30 In/Thru (Front), 2 x L5-30 (Breakered @ 30 Amps), 4 x 20A Duplex (Breakered @ 20 Amps), Fully Enclosed 2RU, 19" Rack Mount, Chassis Depth 5.5"
ETL Listed, L21-30 In/Thru, 12 x 20A Powercon (Breakered @ 20 Amps), Fully Enclosed 2RU, 19" Rack Mount, Chassis Depth 5.5"
ETL Listed, L21-30 In/Thru (Front), 4 x L5-30 (Breakered @ 30 Amps), 2 x 20A Duplex (Breakered @ 20 Amps), Fully Enclosed 2RU, 19" Rack Mount, Chassis Depth 5.5"
L21-30 In/Thru (Front), 4 x L5-30 (Breakered @ 30 Amps), 2 x 20A Duplex (Breakered @ 20 Amps), Fully Enclosed 2RU, 19" Rack Mount, Chassis Depth 5.5"
ETL Listed, L21-30 In/Thru, 8 x 20A Duplex (Breakered @ 20 Amps), Fully Enclosed 2RU, 19" Rack Mount, Chassis Depth 5.5"
ETL Listed, L21-30 In/Thru, 6 x 20A Duplex (Breakered @ 20 Amps), Fully Enclosed 2RU, 19" Rack Mount, Chassis Depth 5.5"
ETL Listed, L14-30 In/Thru, 4 x L5-30 (Breakered @ 30 Amps), 2 x 20A Duplex (Breakered @ 20 Amps), Fully Enclosed 2RU, 19" Rack Mount, Chassis Depth 5.5"
ETL Listed, L14-30 In/Thru, 2 x L5-30 (Breakered @ 30 Amps), 4 x 20A Duplex (Breakered @ 20 Amps), Fully Enclosed 2RU, 19" Rack Mount, Chassis Depth 5.5"
ETL Listed, L14-20 In/Thru, 8 x 20A Duplex (Breakered @ 20 Amps), Fully Enclosed 2RU, 19" Rack Mount, Chassis Depth 5.5"
ETL Listed, L5-30 In/Thru, 8 x 20A Duplex (Breakered @ 20 Amps), Fully Enclosed 2RU, 19" Rack Mount, Chassis Depth 5.5"
ETL Listed, 15A IEC C19 Input, 6 x IEC Sheet E Switched Outputs, Fully Enclosed 1RU, 19" Rack Mount, Chassis Depth 3.75"
Dual 20A Powercon Input, 8 x 20A Edison Outputs (4 Per Input - Breakered @ 20 Amps), Fully Enclosed 1RU, 19" Rack Mount, Chassis Depth 3.75"
Dual 20A Powercon Input, 8 x 15A Edison Outputs (4 Per Input - Breakered @ 15 Amps), Fully Enclosed 1RU, 19" Rack Mount, Chassis Depth 3.75"
ETL Listed, 20A Powercon In/Thru, 6 x 15A Edison Outputs (Breakered @ 15 Amps), Fully Enclosed 1RU, 19" Rack Mount, Chassis Depth 3.75"
ETL Listed, 20A Powercon In/Thru, 2 x 15A Edison Outputs (Front), 6 x 15A Edison Outputs (Rear), All outputs Breakered @ 15 Amps, Fully Enclosed 1RU, 19" Rack Mount, Chassis Depth 3.75"
ETL Listed, 20A Powercon Input in Rear, 6 x 15A Edison Outputs (Breakered @ 15 Amps), Fully Enclosed 1RU, 19" Rack Mount, Chassis Depth 3.75"